Chocolate cake, beer, and bikes. Does it get any better? I recently passed off Jay’s cyclocross fork and front triangle to him so can do his own polishing. He’s an accomplished auto body master so I know it’s in good hands. The lugs he chose are Richard Sachs’s Newvex in stainless (hence the polishing). He has the stainless fork crown to match. This bike is going to a jewel in the mud. Arthi’s frame is pretty much at the same stage right now. Just a front triangle but with so much potential. I should be doing the rear triangle in the coming days. Right now, here are some pictures of some lug carving on the seat lug. Fun stuff. Brian K. came by with cake and beer to build up his flatland bike. The cake was insane. More chocolate than one should ever ingest. We tried anyway and made a good dent in it. Oh yeah, and the bike looks amazing! He upholstered his Primo seat to match. Here are some pics of the event. 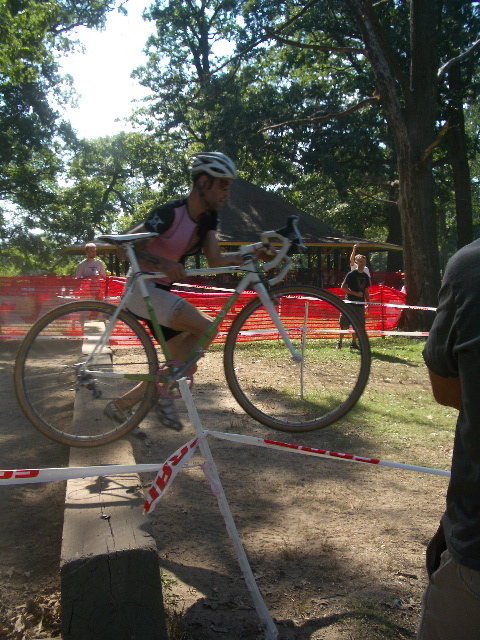 And finally, Dan Langlois is already racing his new frame. I sent it out on Wednesday and he’s totally ripping it up. 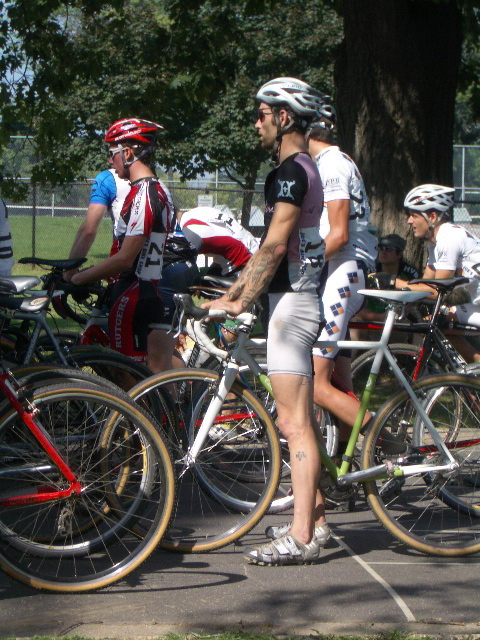 He got fifth at the Charm City Cross race in Baltimore on Sunday. There was a write up in cyclingnews.com that made me laugh: “Dan Langlois of Circle A Cyclocross, was such an unknown that the race announcers resorted to asking anyone who knew anything about him to come forward.” Hilarious. Keep up the great riding, Dan. Posted on September 23, 2008 November 25, 2008 Categories Bike Building1 Comment on Chocolate cake, beer, and bikes. Does it get any better?